Arsenal's title hopes took another blow when they were held to a 1-1 draw at home by Liverpool on Sunday after an astonishing finale in which both teams convert stoppage time penalties. 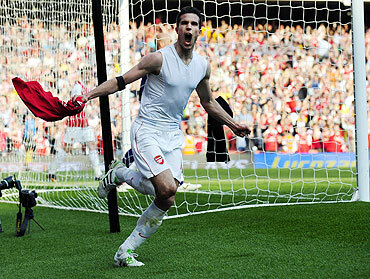 Second-placed Arsenal thought they had won it when Dutch striker Robin van Persie slotted home in the eighth minute of injury time only to see Dirk Kuyt reply from another penalty with the last kick of the game. The 12 minutes added on for treatment of a head injury to Liverpool's Jamie Carragher were a complete contrast to normal time, which featured precious few chances. Arsenal, who are trailing leaders Manchester United by six points with six games remaining, were left to rue a series of missed chances after Laurent Koscielny hit the bar with a header and Van Persie had a goal ruled out for offside. "It was difficult for us to create chances because they defended very deep. Overall they defended well, like most of the Premier League teams that come here, they don't really come out," manager Arsene Wenger told reporters. "We will have to give everything to the last game of the season and see if it is our year or not. It is about winning games. 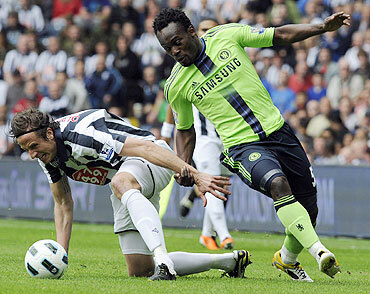 We are on a 15 match unbeaten run but recently we have not taken enough points." Arsenal dominated possession in the first half but Koscielny's header from a Van Persie corner was the closest they came to breaking down a dogged Liverpool defence. Nicklas Bendtner and Andrei Arshavin were thrown on as the home side searched for a goal, which finally came after Jay Spearing tripped Cesc Fabregas to win the penalty converted by Van Persie. But four minutes later, Liverpool replied when Emmanuel Eboue fouled Lucas Leiva and Van Persie's fellow Dutchman Kuyt, who on Saturday extended his contract until 2013, equalised. "I don't think it was a penalty. 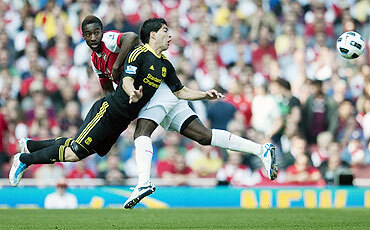 Lucas stopped Eboue's run to go to the ball, it is no penalty. Eboue goes for the ball he doesn't go for the player," said Wenger, who was seen exchanging angry words with Liverpool manager Kenny Dalglish after the final whistle. 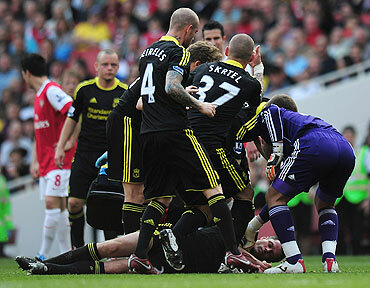 Liverpool, who have not won away at Arsenal since 2000, lost centre-back Carragher, who was carried off on a stretcher after a clash of heads early in the second half. Dalglish praised his side's resolve after Fabio Aurelio had earlier been withdrawn with a hamstring problem and striker Andy Carroll also left the pitch in the second half with an injured knee. "I don't think there is any team anywhere that showed the attitude that we showed today," Dalglish told reporters. "I thought one (of the penalties) was right and one was wrong, you can make up your mind which is which." 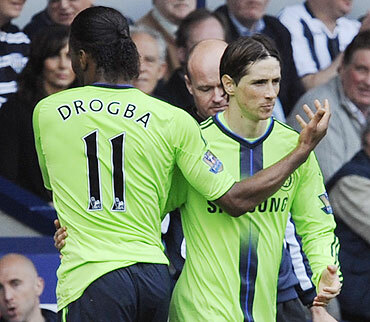 Didier Drogba was on target again as Chelsea, the only top-six team in Premier League action on Saturday, chalked up their 11th successive league win over West Bromwich Albion with a 3-1 triumph at the Hawthorns. Peter Odemwingie had West Brom ahead after 17 minutes but Drogba, Salomon Kalou and Frank Lampard turned it round by halftime as Chelsea bounced back well from their midweek Champions League exit at the hands of Manchester United. At the other end of the table Blackpool's dire run continued as a 3-1 home defeat by Wigan Athletic lifted the winners out of the bottom three and dragged Blackpool, who have won only once in their last 13, into it for the first time this season. "I don't think I've seen a team this season keep Blackpool as quiet as we did, it was a great performance," Wigan boss Roberto Martinez told Sky Sports. West Ham United are now second-last after conceding a late goal in a 2-1 home defeat by Aston Villa while Birmingham City beat Sunderland 2-0 in the day's other match. After their Champions League exit, Chelsea's focus is now entirely on the Premier League and they now have Arsenal, and second place, firmly in their sights. Manager Carlo Ancelotti, widely presumed by many in the British media to be on his way out of the club at the end of the season, started without Fernando Torres or Nicolas Anelka, his preferred strike duo at Old Trafford on Tuesday. Drogba, who came off the bench to score in that match, took his starting opportunity with aplomb as he scored his side's opener and had a hand in the next two. West Brom started full of the confidence that a seven-game unbeaten run builds and went ahead with a neat chipped finish by Peter Odemwingie after 17 minutes. Drogba tapped in the equaliser five minutes later and when Scott Carson parried his 26th-minute shot, Kalou banged in the rebound. 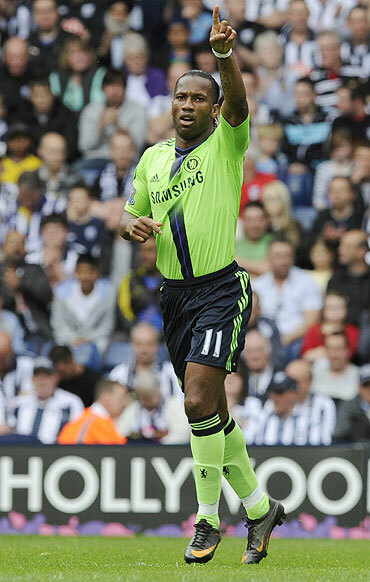 Drogba then combined with Florent Malouda to set up Lampard for the third just before the break. Chelsea cruised home after the break with Torres eventually joining the fray for the last seven minutes and even having the ball in the net -- only for the goal to be ruled out for offside. "It was a very important performance after the defeat at Manchester United," Ancelotti told Sky Sports. "We were in focus, solid, played a good game and won. We reacted immediately (to their goal) and scored three in the first half." The Italian said that Torres would feature more in the team's remaining games. "I maintain my confidence in him," he said. "Maybe he's lost a bit of confidence but he has to know that everyone at the club has a lot of confidence in his quality."